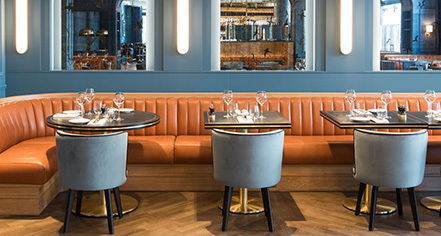 Diners at The Trafalgar St. James London, Curio Collection by Hilton can expect diverse, unique dining experiences. From a nutritious breakfast to a night cap, brunches and pre-dinner drinks, The Trafalgar delivers at any time of day. 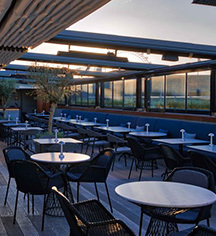 The Rooftop at The Trafalgar is a perfect place to relax with a drink while overlooking the city. The canopy covered seating, outdoor heaters, and blanket selections provides guests with a year-round, enjoyable experience. Small plates are available and reservations are encouraged. The Trafalgar Dining Rooms offer up sweeping views of Trafalgar Square; fresh, local ingredients; and signature service with a Mediterranean flair. A broad wine list, classic dishes, and a cultural melting pot welcomes native Londoners and travelers alike to create a friendly atmosphere in an elegant setting. The house living room on the lower ground floor of the hotel is called Biblio. Ambient lighting and artisan cocktails create the intimate feel that’s perfect to begin or end an evening. Try any of these locations, or go from bottom to top to end the night with the city lights.